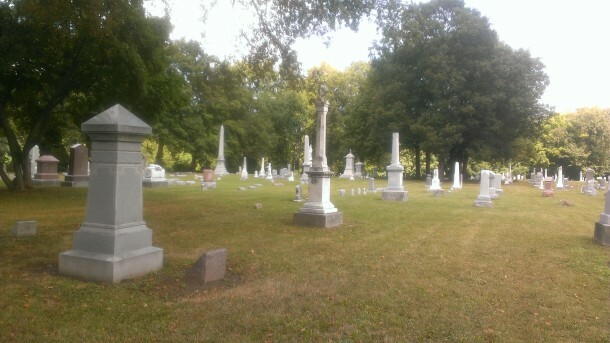 Fall Creek Cemetery, a true Indiana pioneer graveyard, can be found at approximately 4100 Millersville Road, just east of Keystone Avenue — tucked between an aging urban business district and the contrasting beauty of the Fall Creek Parkway Trail. 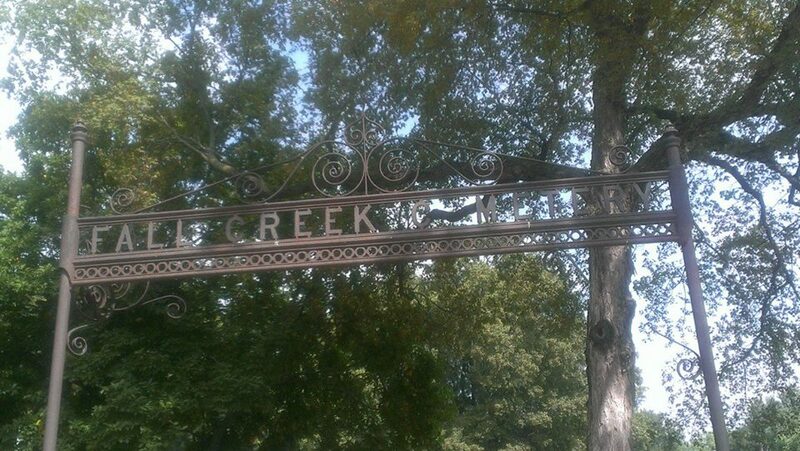 At the time of its origin, the cemetery was located in an area that was called “Millersville,” aptly named for the multiple gristmill sites located along neighboring Fall Creek. Millersville was never officially platted or incorporated. Photo circa 1867. Adjacent to the Fall Creek Cemetery, this Ebenezer Church sanctuary was built in 1853 to replace the original log church that had been used by the congregation since its founding in 1838. Ebenezer held its last service at the Millersville location in 1986. Of course, it’s nearly impossible to tell the story of the cemetery without, to some extent, telling the story of the Ebenezer Lutheran Church (sometimes called Ebenezer Union in historical documents) that sat adjacent to the cemetery property. In the mid-1820s, seven families from the Zion Lutheran Church in Middletown, Maryland came to Indiana (first to New Harmony, then on to Indianapolis) where they founded the Ebenezer Lutheran Church in Washington Township. The founding church members were: Jacob Ringer Sr.and Jr., Conrad Ringer, George Peter (Braun) Brown, George (Braun) Brown, John (Braun) Brown, Daniel Shartz, Daniel (Schmeh) Smay, Daniel (Bauer) Bower, King English, and Solomon Easterday. 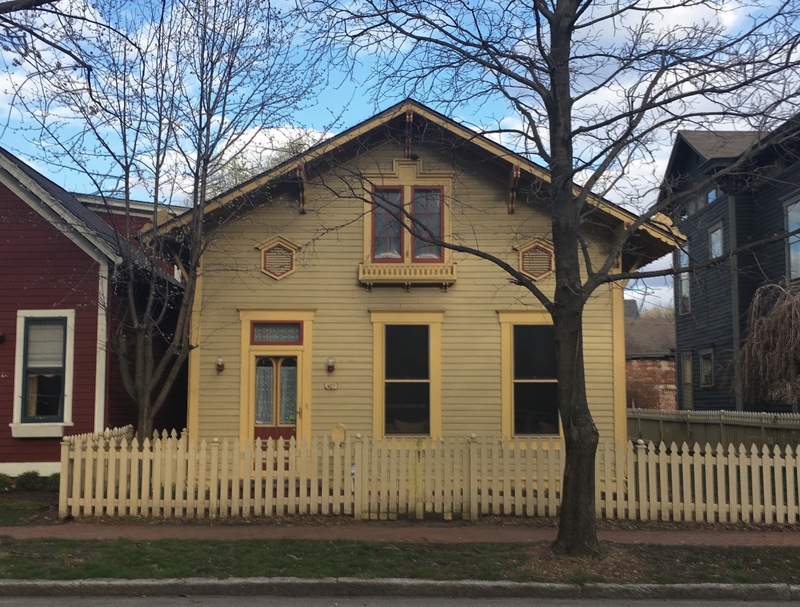 These pioneering families would join the few other settlers already in the area, establishing businesses and farms in the rudimentary communities of Millersville, Nora, and Broad Ripple. The land was fertile and wild game was plentiful. Fall Creek provided ample access to water for life- and business-sustaining opportunities, and fishing was abundant. 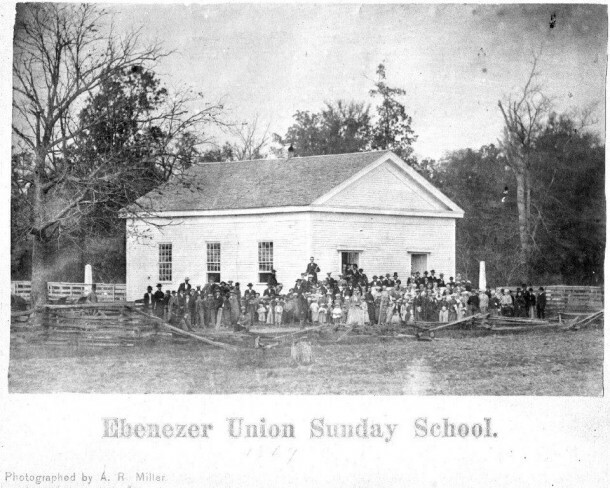 The leadership of the newly-founded Ebenezer Lutheran church went about the business of Christian life: supporting, teaching, baptizing, and burying members of the church and the surrounding community — initially convening services in a temporary log cabin and then in 1853, in its first permanent church building, the clapboard-built structure (below). This church  was the second one built since the congregation’s founding in 1838. On an interesting side note, another local place of worship, the Highland church and graveyard, (pictured below) was constructed in the vicinity — near 46th Street and Emerson Avenue. 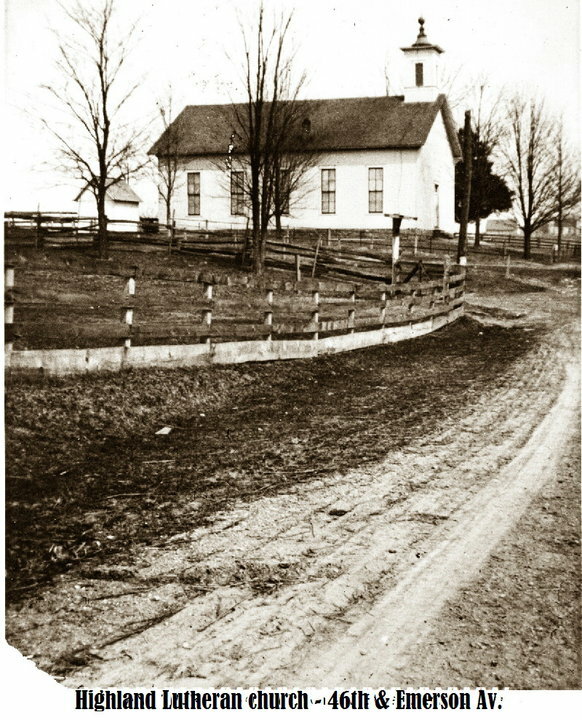 The Highland church was founded in the late 1860s due to a doctrinal disagreement among members at the Ebenezer Lutheran Church. 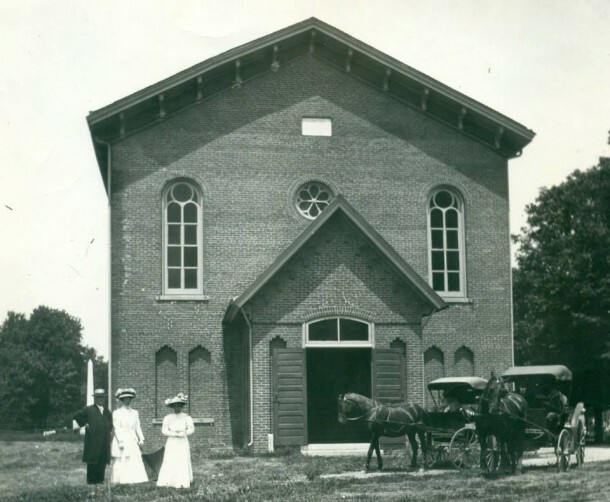 Half the members including the Negley family (Millersville founders) established this new church, calling it the Upper Ebenezer Church — but later renaming it Highland. – A great many from amongst the membership of the Millersville Masonic Lodge including Thomas Hammond, original owner of the historic Hammond’s Grove area that became a popular park in the late 1800s and early 1900s. The third Ebenezer Church, which was dedicated on January 10, 1875, was the only brick church in Washington Township. 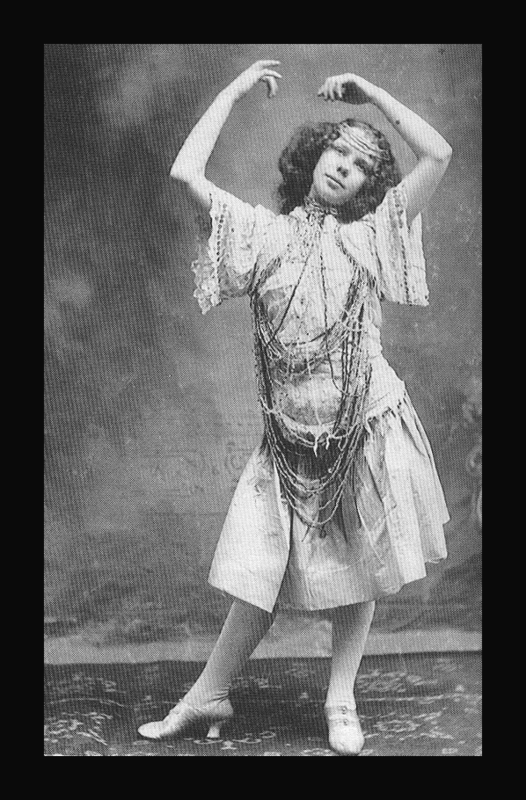 Photo circa 1914. The view across the street from Ebenezer church (which later became Meadows shopping center). 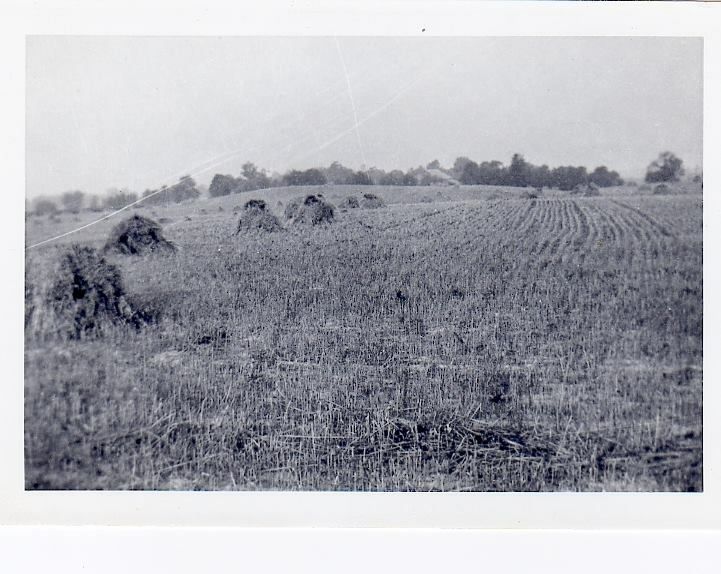 The Roberts Dairy family owned all the land from Millersville Road south to 38th Street. This was grazing land for their cows. 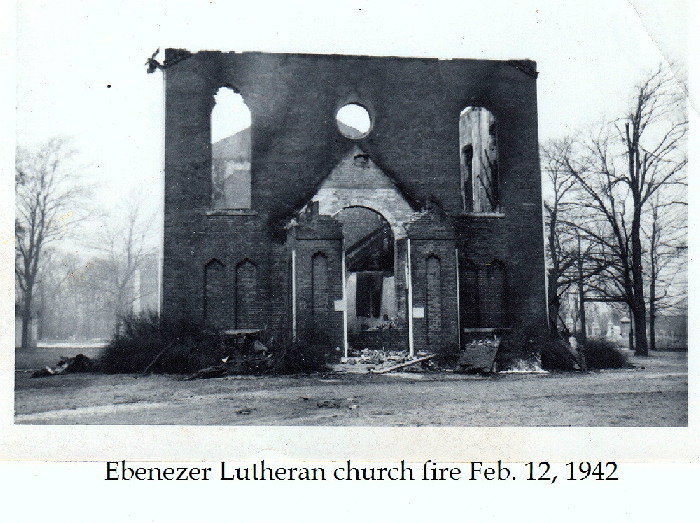 When fire destroyed the congregation’s 70 year old church building, the damage was estimated at $20,000. 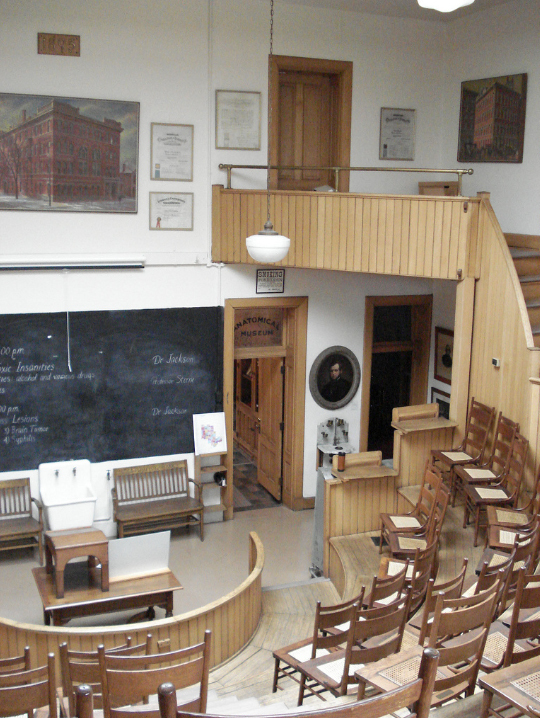 For the next fifteen months, services were conducted in temporary quarters, most often in the Millersville Masonic Lodge. 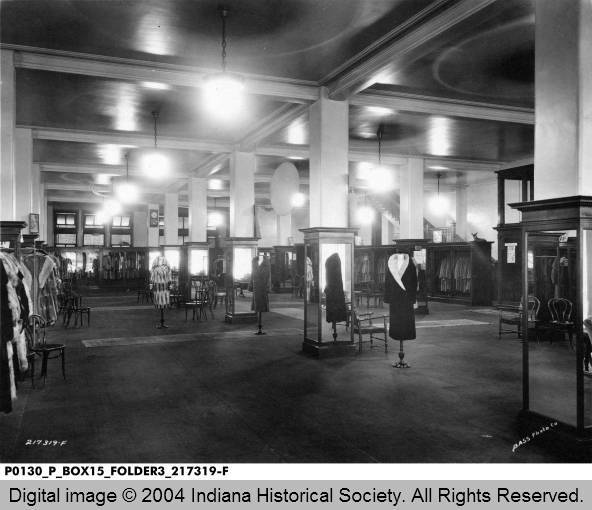 The City of Indianapolis overtook the quiet country life of Millersville in the mid-20th Century. The land around the cemetery and church was transformed from rural to urban as the founders’ farms began to be parsed out, piece by piece, for the development of suburbs and businesses. Eventually the demographics of the area changed. The church and cemetery fell into grave disrepair (pun intended) in the 1960s and 1970s, as middle-income and affluent residents moved (mostly) north. 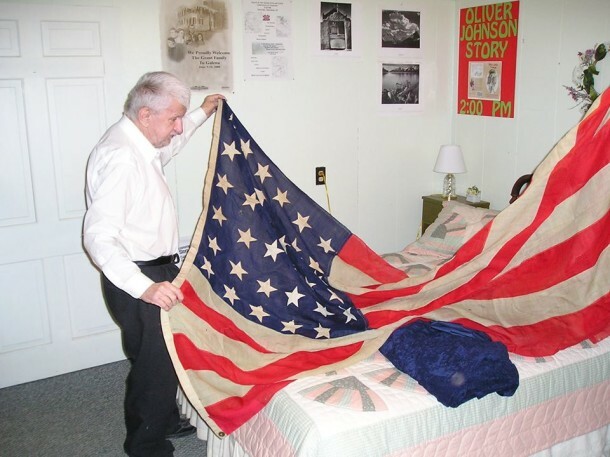 Local historian, Earl Anderson, displaying the 36 star American Flag that hung on the wall behind the pulpit at Ebenezer church during the Civil War. He acquired it after the church closed along with many history records. Directly adjacent to Fall Creek Cemetery, Ebenezer Lutheran Church ceased to meet in this building in 1986. 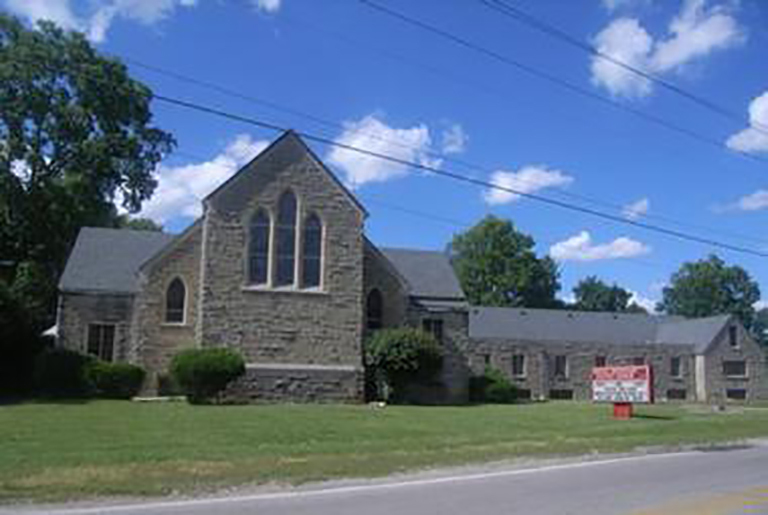 The location is now home to the Indiana Baptist Church. Then, about ten years ago, the newly-elected Washington Township Trustee, Gwen Horth, discovered that there were several abandoned cemeteries in her district in very bad condition from years of neglect and vandalism. Horth identified funds and contacted a professional restorationist by the name of John “Walt” Walters. In 2002, Walt and his crew from Graveyard Groomers, along with some local volunteers, undertook the restoration of the Fall Creek Cemetery. The crew started, with snow still on the ground, removing immense brush and poison ivy over-growth. Many beautiful old markers (977, to be exact) were in need of relocation, resetting or repair due to the ravages of time and vandalism. Thanks to this nearly-two-year effort, the Fall Creek Cemetery, with over 1050 burial plots, is once again a fitting memorial to the lives of Millersville pioneers. Restorationist “Walt” Walters in 2003. The group worked meticulously to locate, straighten and level every grave marker. Heavy restoration: Larger monuments sink due to their weight and the fact that the wood coffin below collapses, over time. 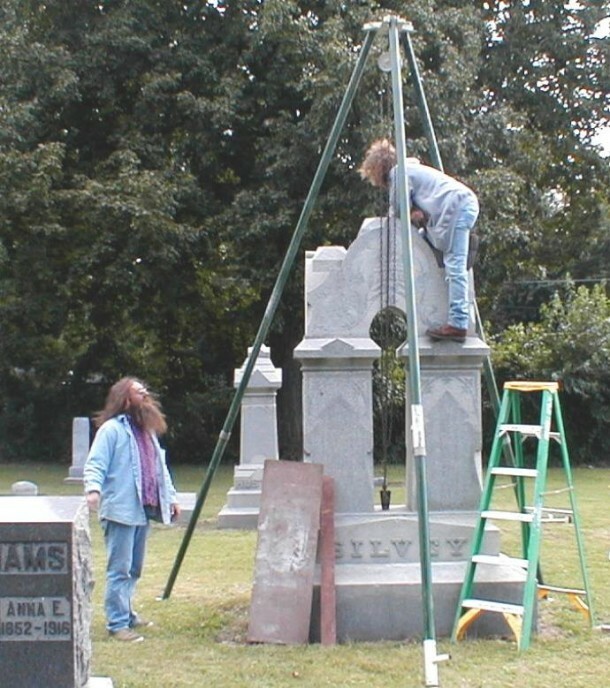 Many of the major Fall Creek Cemetery monuments had to be lifted and reset to form a more permanent support — some requiring several days of work. Restoration team member Danny Ferris putting in some long hours to remove yards of over growth in the cemetery. 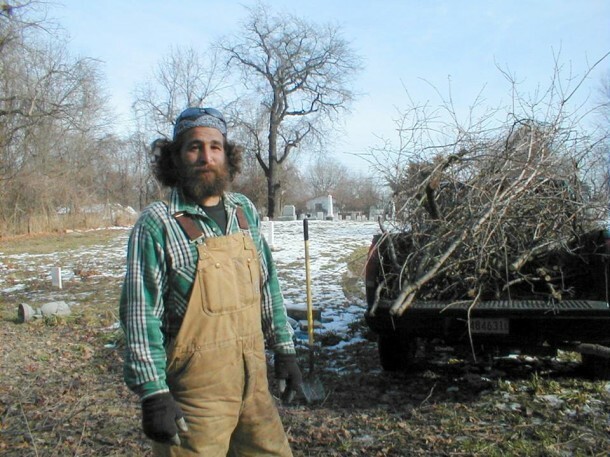 Notice the tall wild cherry tree behind Ferris; It is a “witness tree,” that was used in the 1836 land survey. Tucked away and nicely groomed, a visitor to the Fall Creek Cemetery will find the graves of Indiana pioneers, and veterans from the Revolutionary War to WWII. This marker had sunk 2/3rds of the way into the ground before restoration. Now readable, it tells a quirky tale of the Brown family — evidently a very hardy lot. It is documented that the women in the family preferred field work to house work and when the state fair commenced every year, they would enter contests against the men in harvesting — sometimes winning! This leads me to my final *interesting side note: While researching this article, My husband and I met with a friend and avid amateur historian who had participated in the restoration of the graveyard years before. 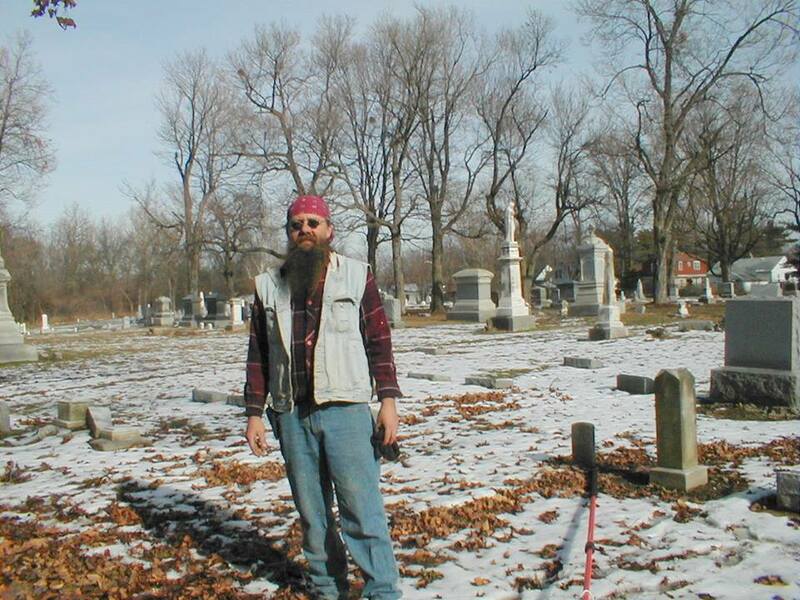 He gave us a “roots tour” of the cemetery, pointing out the graves of the area’s founding fathers and noting some of the challenges that arose from trying to locate sunken grave stones and restore broken markers. I took photos of the tranquil little “park” and posted them to my Facebook page, as any good history nerd would. To my surprise, about a half hour later I learned via a family member that we stood only feet from the grave of my husband’s great-grandfather. We had no idea. 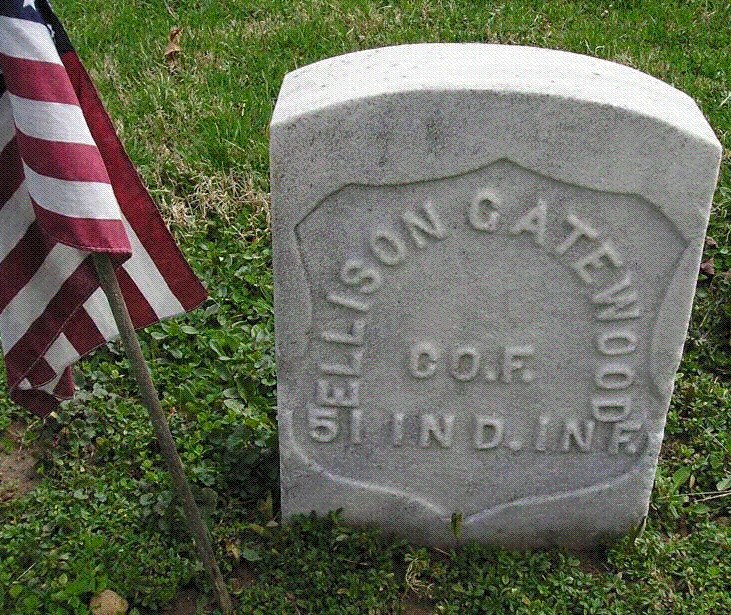 Great-grandpa Gatewood, enjoy your 15 minutes of fame, wherever you are. Wow… it IS a small (after)world! What surprising things did you learn about your family while cemetery sleuthing? Lisa Lorentz is a writer, nonprofit director, native Hoosier & Indianapolitan with an awkward fascination for dusty attics, antique typewriters and microfilm. Thanks, Lisa — now bring the history of 46th and Emerson up to date. On the northeast corner is St. Alban’s Episcopal Church. Anyone interested should visit at 10:30 A.M. this Sunday or the next two while the Rev’d Jean Smith is still the rector. On the northwest is an African-= Ameriican congregation that has as large a gym as the size of the church. They had a bit of trouble when they were building the church. It was knocked down twice by wind, but persevered and finally have a larger congregation than St. Albans. The southeast and southwest corners of trhe intersection do not have buildings and I suspect that drainage may be an issue for anything on the southeast corner. SO, who will be the on-going historian of this major corner of Indy? Thanks for reading, Norm! I do find the history of this part of the city fascinating. So many good stories! I’ve never got out of my car to look at them, but there are still a few headstones visible in front of the church at 46th and Emerson. Also, used to work across the street from the Fall Creek Cemetery and would occasionally go there during lunch so I really appreciated reading its history. Walt and his Graveyard Groomers are a great team, and I’ve never met Bob Alloway but I know he also does a lot of good for old cemeteries so I’ll give him a shout out too. Tom – definitely check out the Fall Creek cemetery now. I enjoyed researching this article and especially meeting the devoted preservationists, amateur historians and volunteers who devote so much time to protecting and restoring these near-forgotten sites. Thanks for reading! I’ve noted on several maps that in approximately the 4100 block of Millersville Road there’s a cemetery named the “Sutherland” cemetery. I was wondering if this was originally a family cemetery, like for the Sutherland family that used to farm land near the former State Fairgrounds south of Sutherland Avenue on the Near North Side? That’s a fair guess, Basil. I will have to do some digging to be sure. Thanks for reading! As a member of Haverford Moravian Church during the 1980’s, which was at 54th and Haverford, we used that Ebeneezer cemetery as a close one to hold Moravian Brass Choir Easter Sunrise Services, when we could muster a semblance of a brass choir. As I understood it, the Moravians always used that cemetery for the Easter Sunrise since at least 1949. And by sunrise, I do mean as the sun came up ! So I am sure over the years, until the Haverford congregation ceased operation, the neighbors there at Ebeneezer often were awakened by brass choir serenades on Easter morning. Here is a sample of Moravian Brass Easter Sunrise from the Lititz, PA. cemetery. The church in Lititz provided the down payment money for the Haverford Church in Indy and a Lititz bank held the mortgage until it was paid off. The Haverford congregation is no more but the church building still stands and houses a local non-denominational congregation. I will have to go back to 4100 Millersville Rd. and visit one day to see the ‘restored’ look of the Ebeneezer Cemetery. Fun side-note, Mike! Do go by and check out the cemetery when you get a chance. With so many trees, it will be quite lovely as fall approaches! Good work, Lisa! And, thanks for doing this. I’m just now catching up on your recent additions to the Millersville story. You’ve done some amazing research and it’s nice to see that readers are reacting. I know it’s time consuming, but I hope you’re able to continue enlightening us each Friday! I have been wanting to check this cemetery out for a long time. My grandfather was Vernon Summers, who died in the 1960s. His grandmother was Lydia Cass Brown. 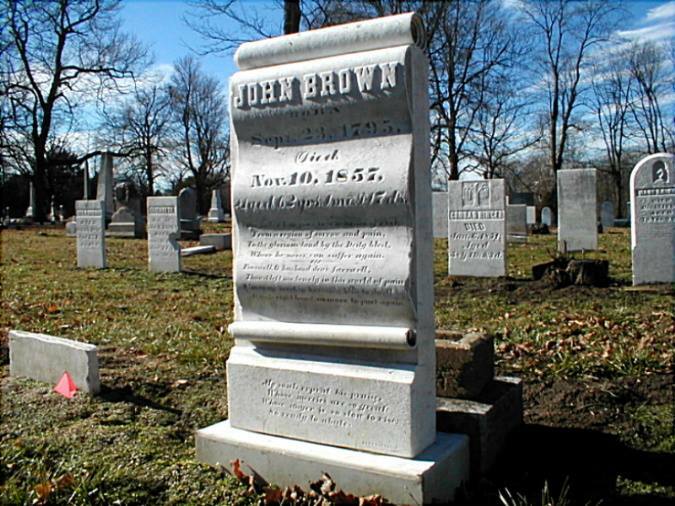 The Browns that are buried from our family tree one of them was John Brown, B 9/23/1795, D 11/10/1857. His mother Lydia was buried in Winchester, Indiana. Grandfather Summers was one of 7 boys and 1 girl. Yes 8 children. I would love to talk with you, this is wonderful the restoration of this cemetery. Thank you from the bottom of my heart for putting this together. My great-grandmother is Ethel Delana (nee: Harper) Brown who was married to Gilbert Brown and daughter of Charles D. Harper & Frances (nee: Tyner) Harper; all of whom are buried in this cemetery. 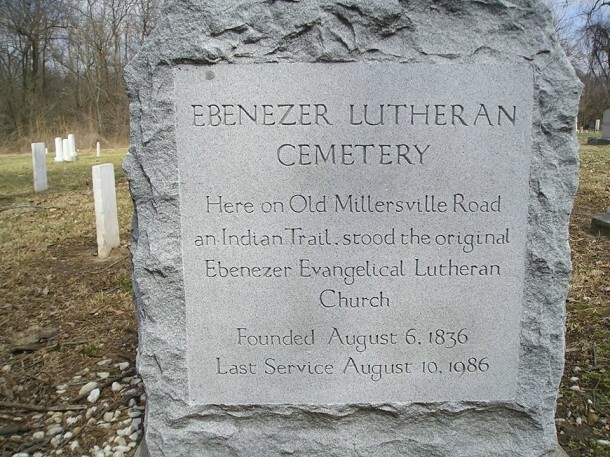 As a matter of fact, most of my great-grandmother’s direct relatives are buried at Ebenezer. Through the family tree, I am a descendant of David Ringer, a founding member of Ebenezer Lutheran. 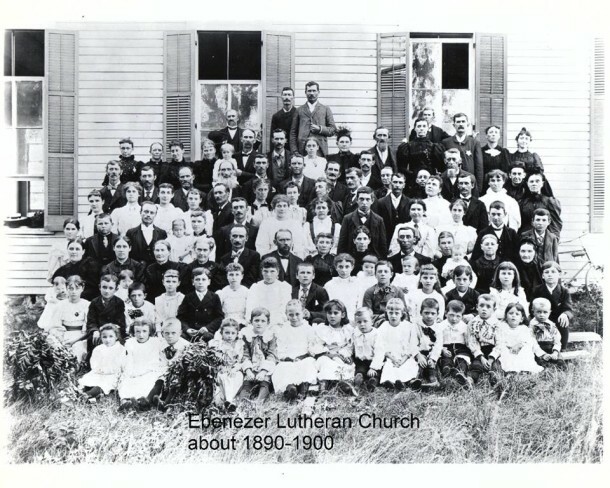 The Ringer family came from Middletown, Maryland, and were members of the German-speaking Zion Lutheran Church; the first Pastor, Abraham Reck, was an outstanding leader. As church records reflect, Jacob Ringer was enlisted in the Frederick County, Maryland – Middle District Company of the Continental Army in the American Revolution War. Believe it or not, I have never been to the Church or Cemetery, despite growing up in the constant care of my grandmother and great-grandmother, which provided a strong connection. I moved from Indiana 39 years ago to about 30 minutes from the Zion Lutheran where the founding Ringer family originated. My name is John Easterday and my great, great grandfather, Solomon Easterday, was one of the original founders of the Church from the Middletown Valley of Maryland. In addition, my great, great grandmother, great grand father and mother, grandmother and grandfather, father and mother are buried there along with man other relatives including the Lankford and Culbertsons. I want to thank you and Walt Walters for everything you have done. I live in Wisconsin now and rarely have an opportunity to visit though I try every time I am back home. My mother, Sue Ann LaGrotta Easterday is perhaps the last person to be buried there (December 2011). buried at the Ebenezer Lutheran , Highland or Fall Creek Cemeteries. 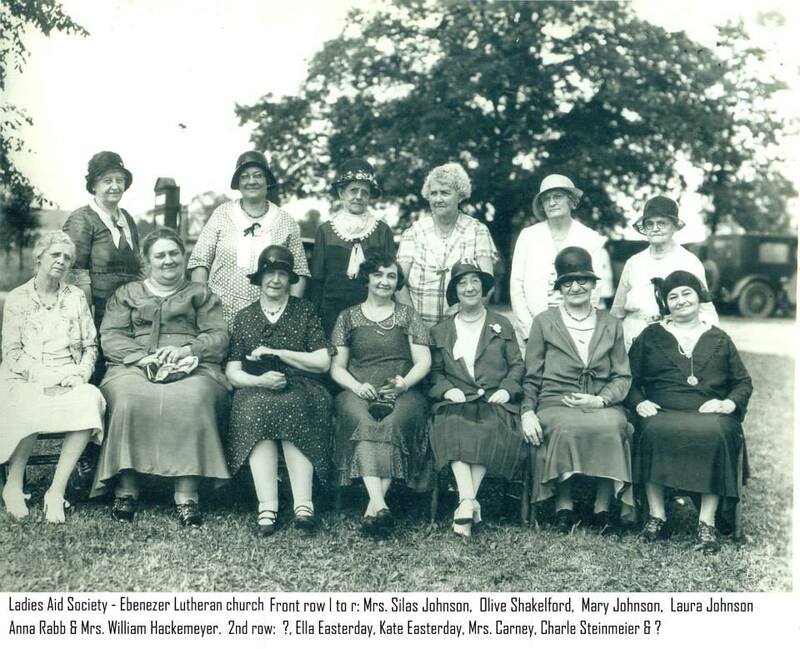 I have seen their names in the early Ebenezer Lutheran Church records that are on-line. Abel’s mother Mary Swords died about 1850 as well. Let me know how I may research. Thank you for your article. Many of my Spahr ancestors are buried in this beautiful cemetery and were members of the Ebenezer Lutheran Church as early as 1845.